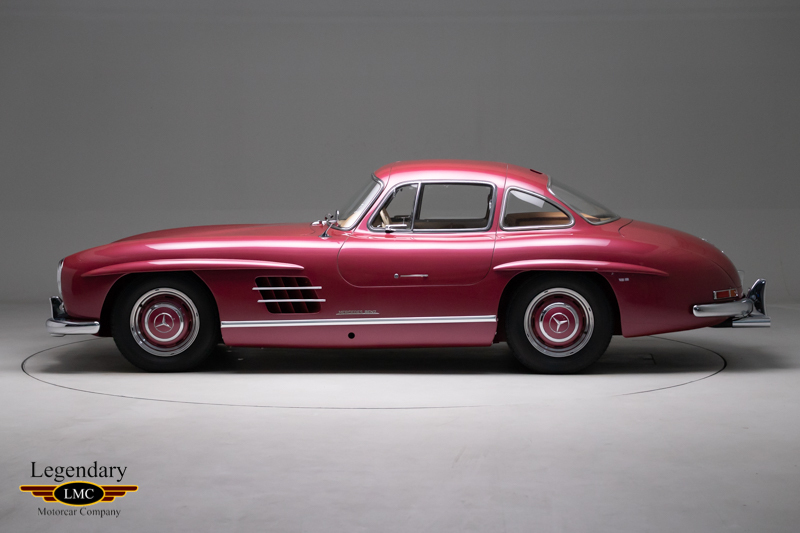 Click any thumbnail below to display the 1956 Mercedes-Benz 300SL Gullwing slide show. 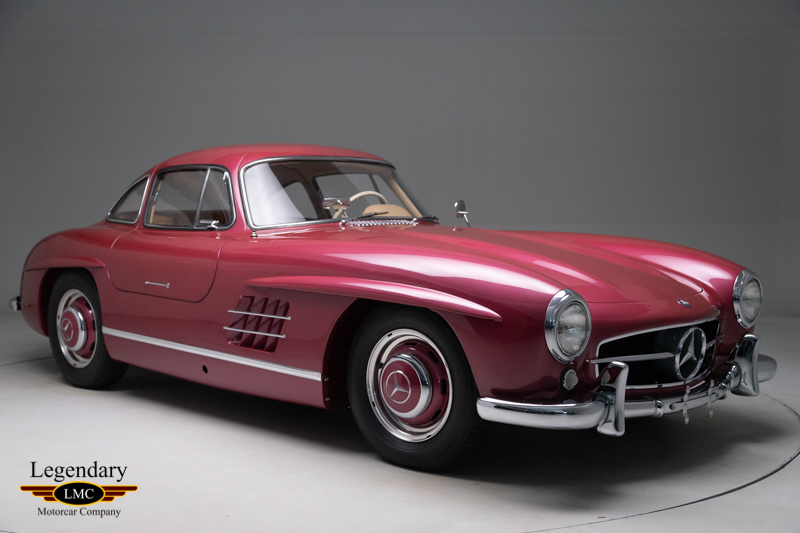 Mercedes-Benz initially had no plans for a series production of its racing 300 SL, however its U.S. importer, Max Hoffman, had other ideas. 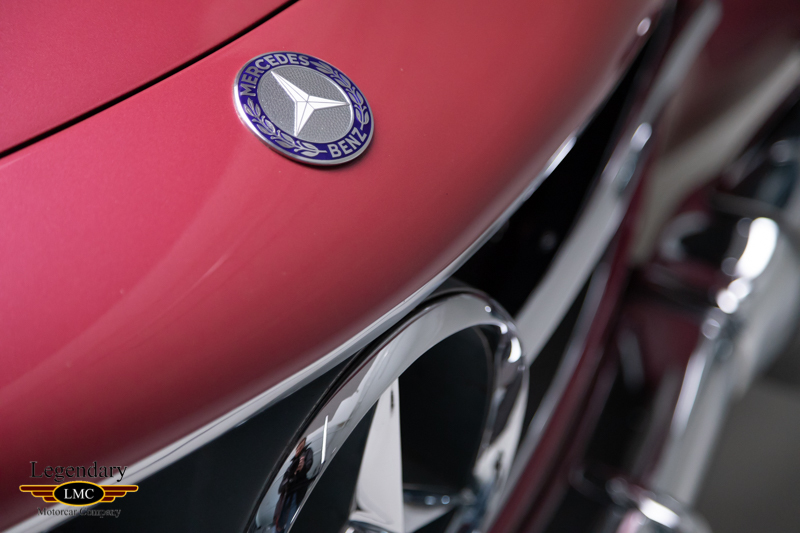 Hoffman, a master marketer and a man of great insight, convinced Daimler-Benz to offer a production model by ordering 1,000 of them for sale in the United States. 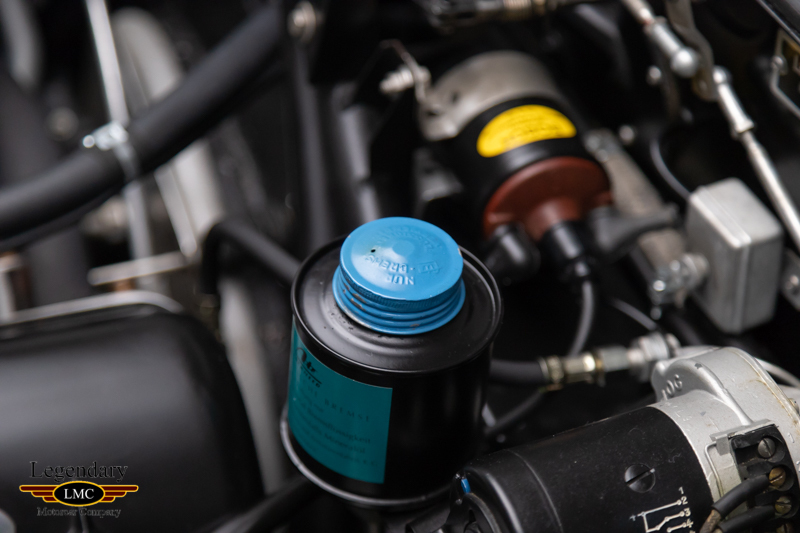 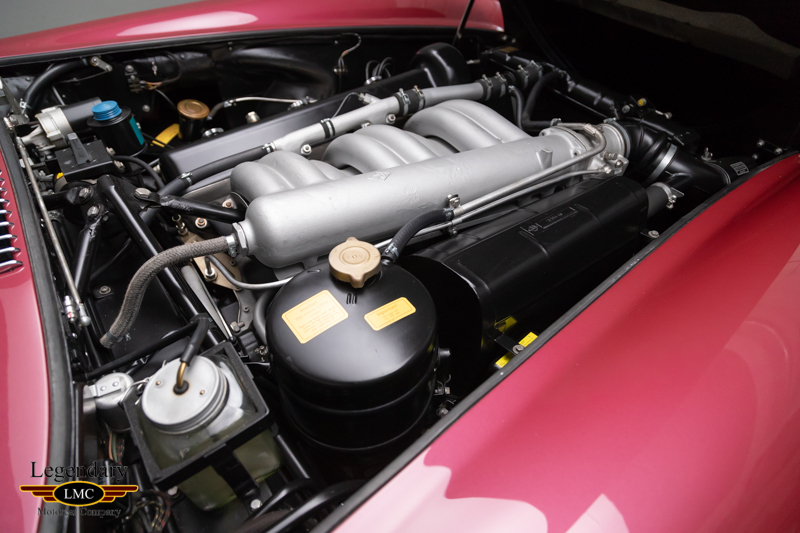 Fuel injection replaced the race car’s carburetors and the Bosch mechanical unit would be the first for a production car. 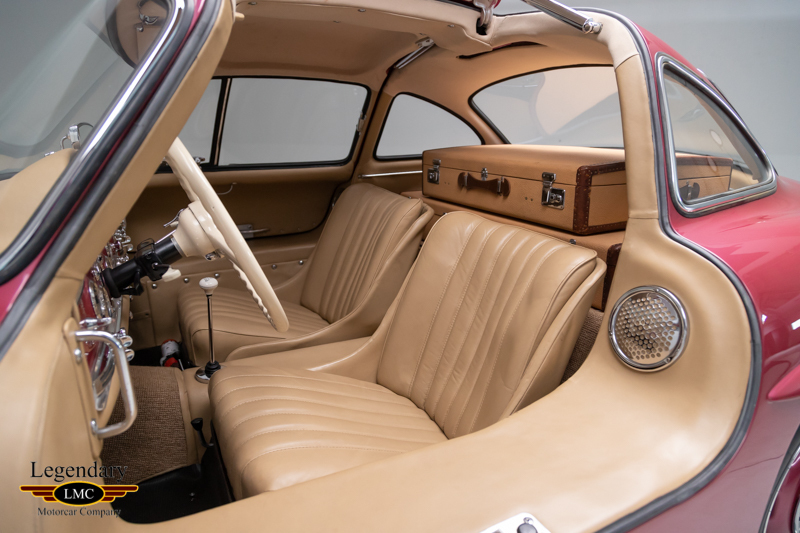 After a handful of early production models were made in alloy, as the competition cars were, the new Karl Wilfert-designed body was largely constructed of steel, however it retained aluminum doors, hood, and trunk lid, and included the bumpers (with over-riders for U.S.-spec cars). 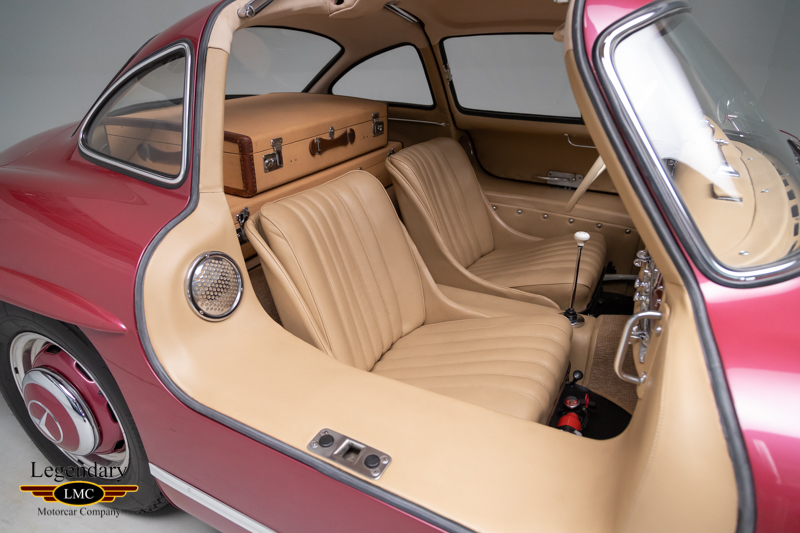 Numerous creature comforts were added as well, including a tilt-wheel for ease of entry and a sumptuous interior that is requisite for road use. 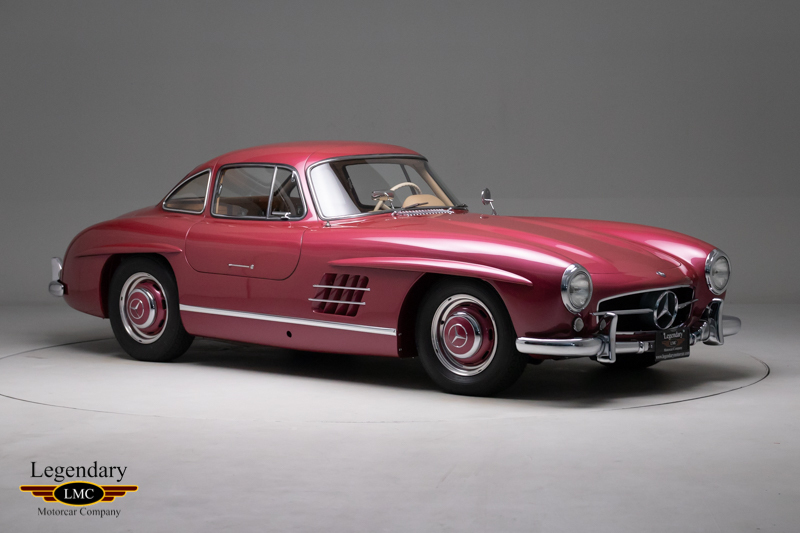 Of particular note, the 300 SL was the first Mercedes to be introduced in the United States before it was shown in Germany, and when it was unveiled in New York on February 6th, 1954, it took the automotive world by storm. 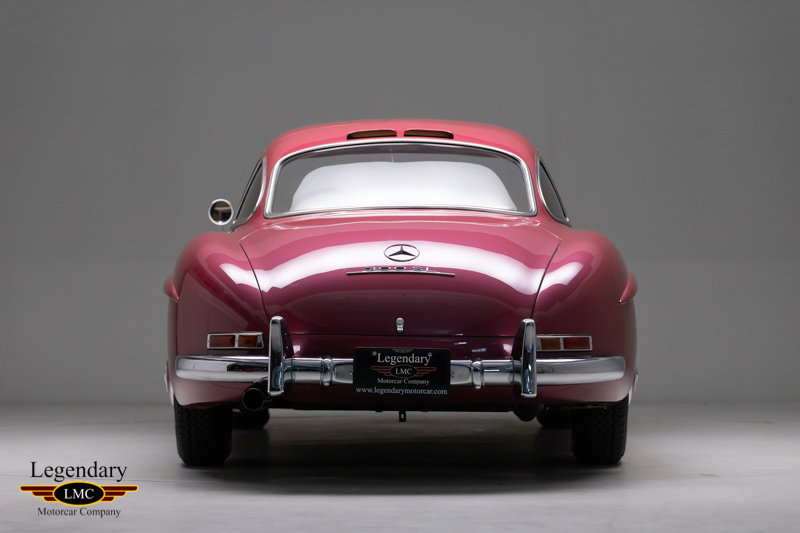 The “SL” (translated to English as Sport Light) moniker reflected the pioneering use of welded tubular-steel frame construction. 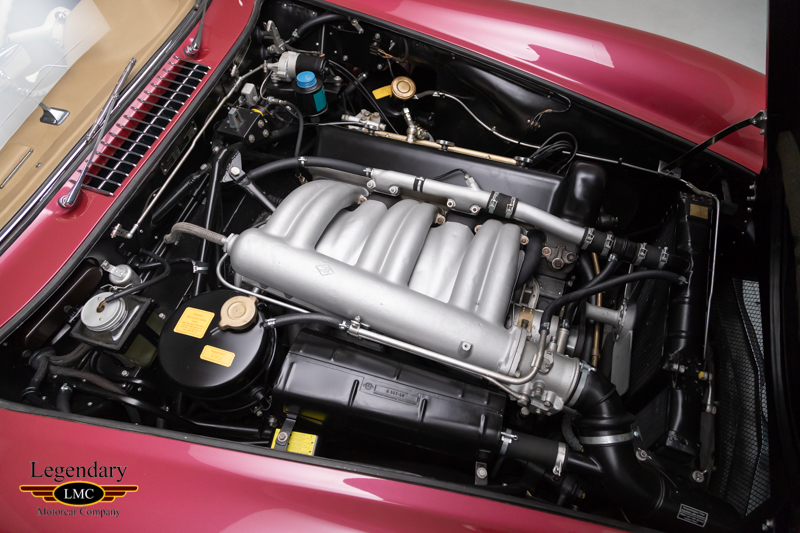 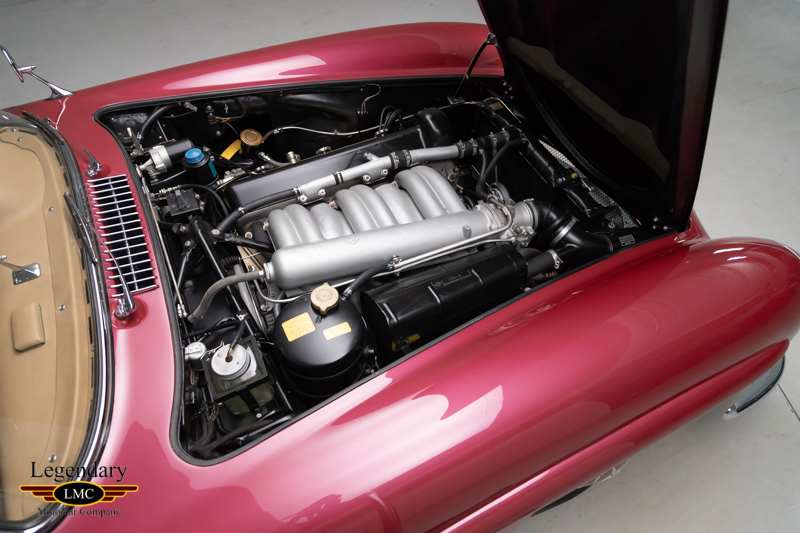 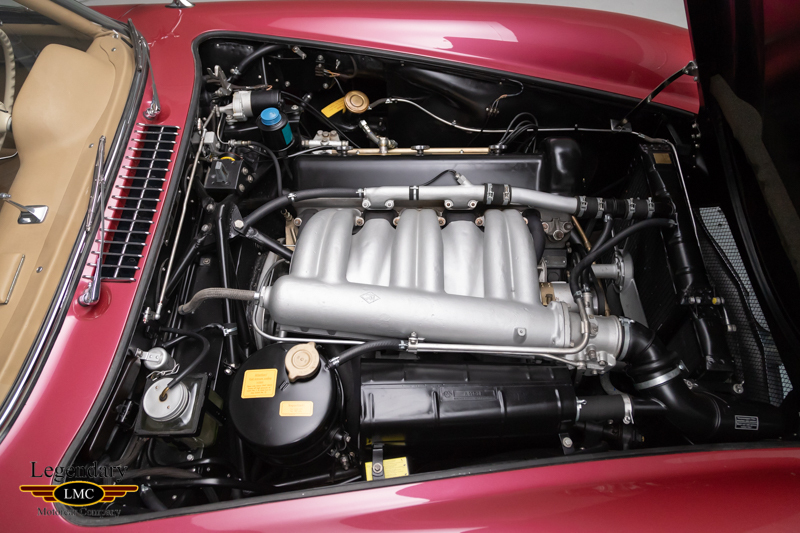 It also featured a fully independent suspension in addition to its fuel-injected, 3.0-litre (2,996 cubic centimeter) OHC straight six with dry-sump lubrication. 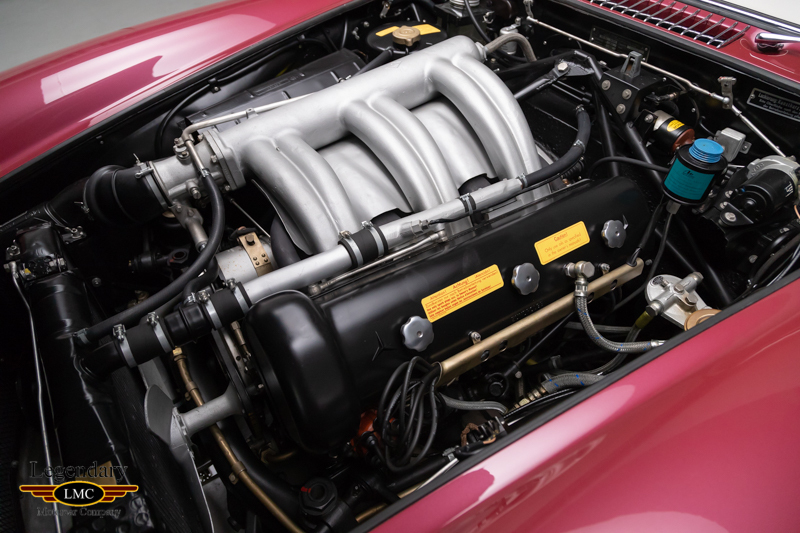 Interestingly, the motor was angled slightly to the side in order to clear the low-profile hood and reduce the height of the front end. 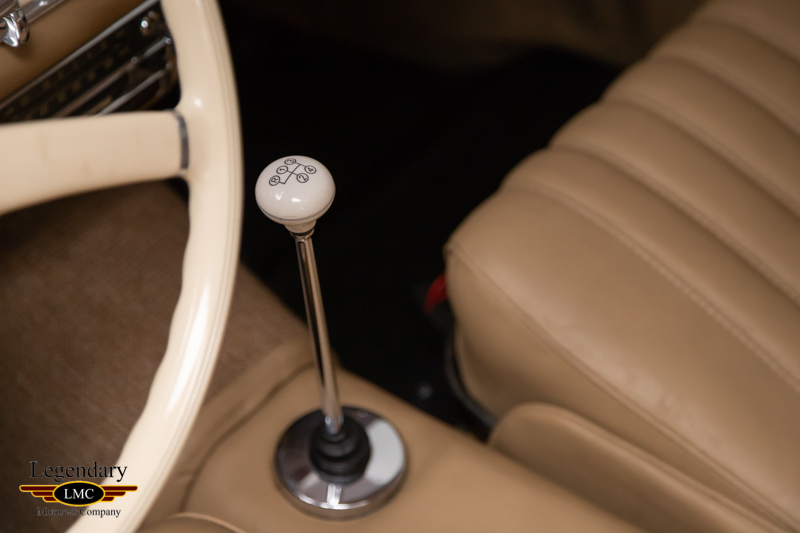 The power, rated at 240 brake horsepower at 6,100 rpm (SAE) and 215 brake horsepower at 5,800 rpm (DIN) with the factory-optional or dealer-installed “sport” camshaft, was delivered through a four-speed manual gearbox. 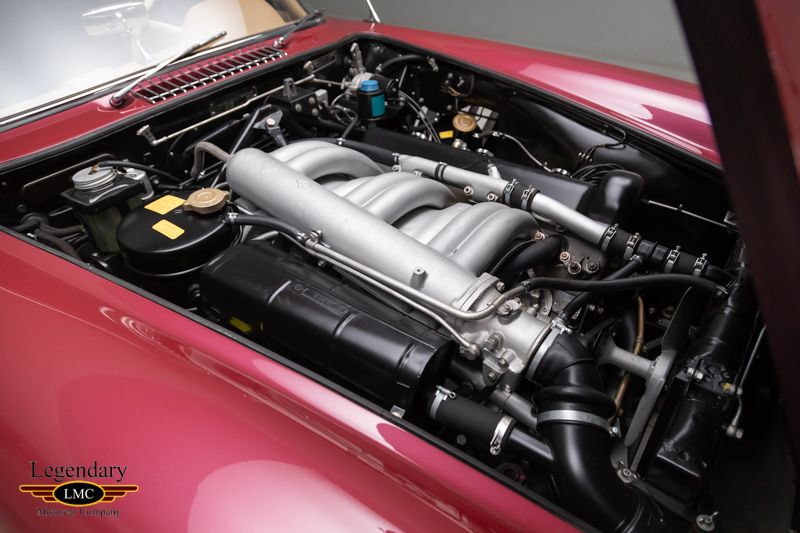 Capable of a top speed of 161 mph and with a 0–60 acceleration time of approximately eight seconds (depending upon the rear-end ratio selected from five options), the 300 SL was the fastest production automobile of its time. 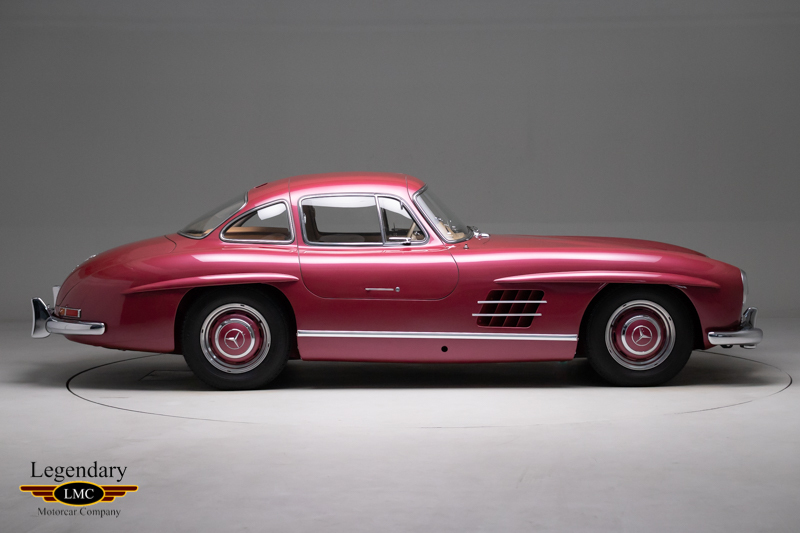 The dramatic, upward-opening “gullwing” doors of the racing version of the car continued into production and contributed largely to the unique visual signature of the 300 SL. 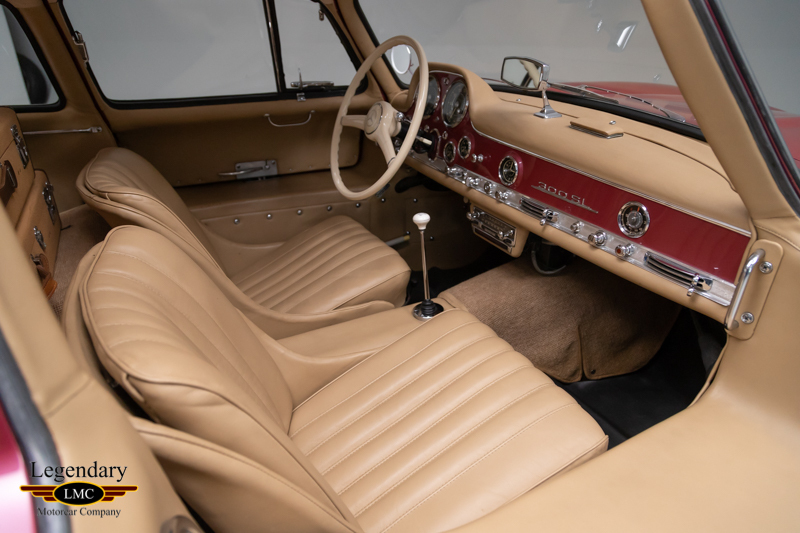 When production ended after the 1957 model year, Hoffman’s original request for 1,000 cars was exceeded, as production of the semi-hand-built car reached just 1,400 units. 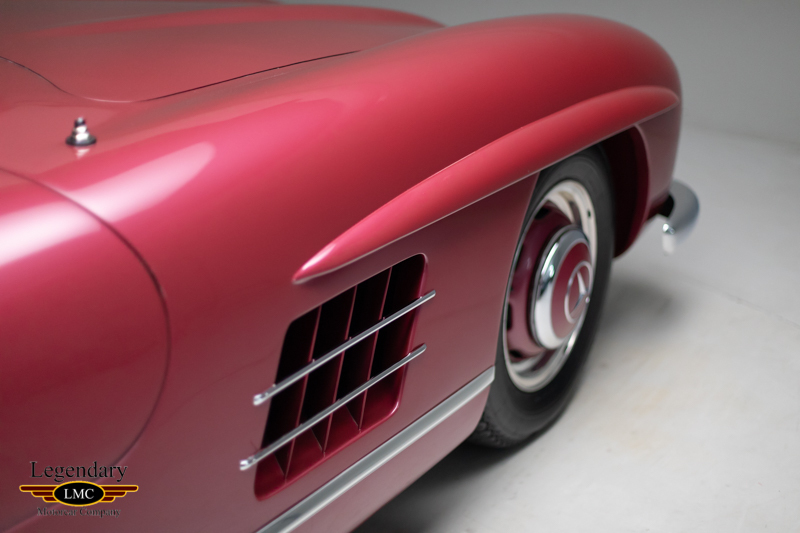 Demand has always been strong, and today, the 300 SL continues to be one of the most recognized and coveted of all sporting cars. 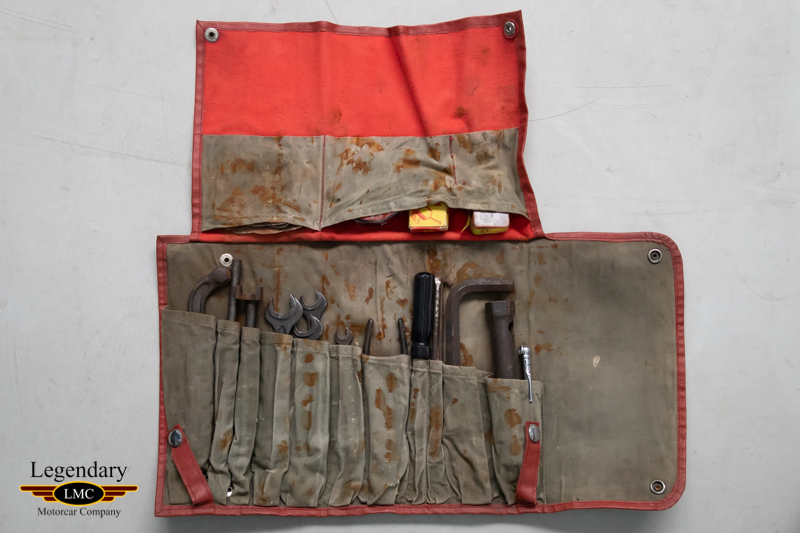 It is almost indisputably considered the “core” model for any serious collection. 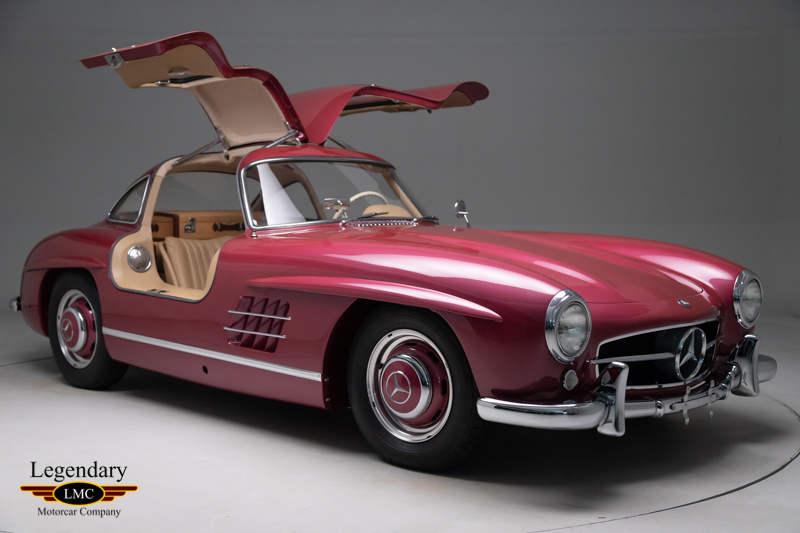 This 300 SL Gullwing, according to official Mercedes-Benz records, was completed by the factory on August, 11, 1956 and shipped to the Mercedes-Benz dealership located in Dusseildorf, Germany on August 13. 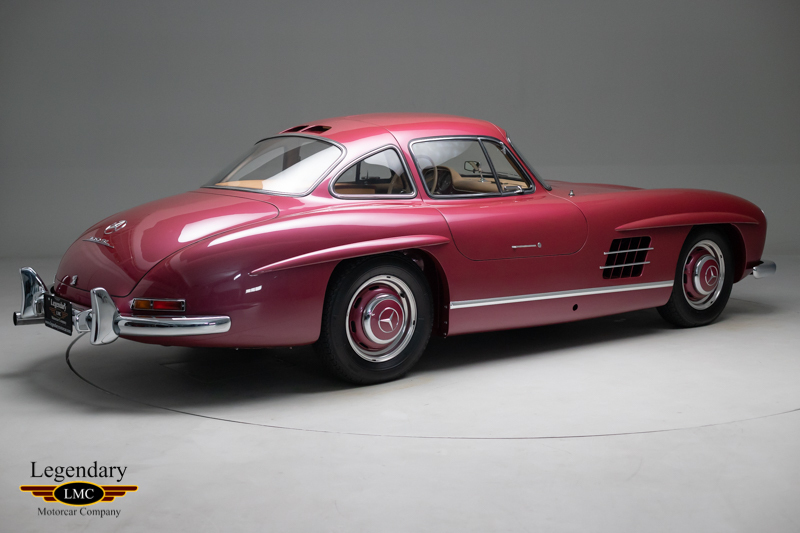 This Gullwing was special ordered, finished in graphite gray with blue plaid interior for the car’s first owner, the Prince of Salm-Salm. 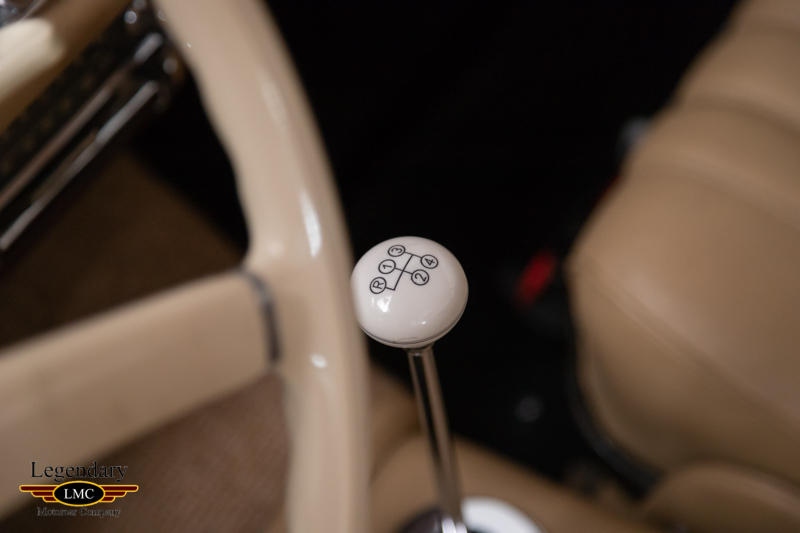 (Salm-Salm was a small Principality located in the north-western part of what is now modern-day France, however the line of mediatized princes continues to this day). 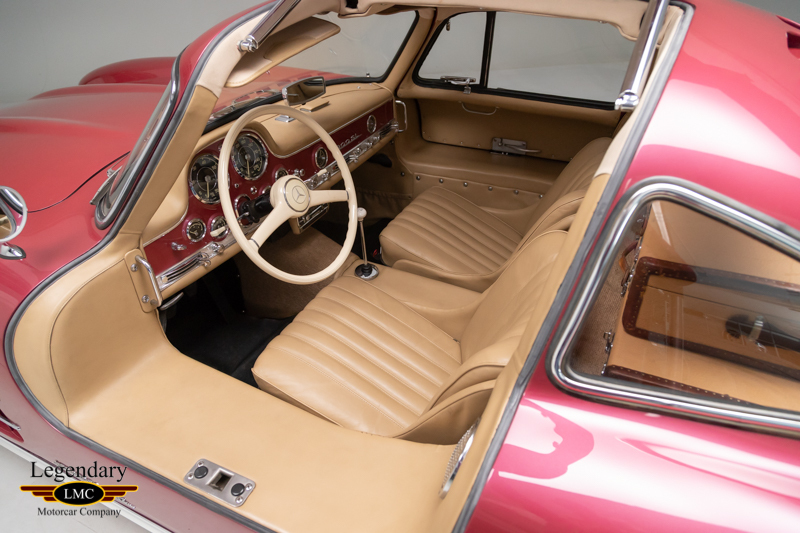 The Prince retained ownership of the Gullwing until Dr J. Theodore Luros, a neurosurgeon from Indianapolis, Indiana acquired the car in 1961, as evidenced by his original bill of sale dated March 2, 1961 that accompanies the car. 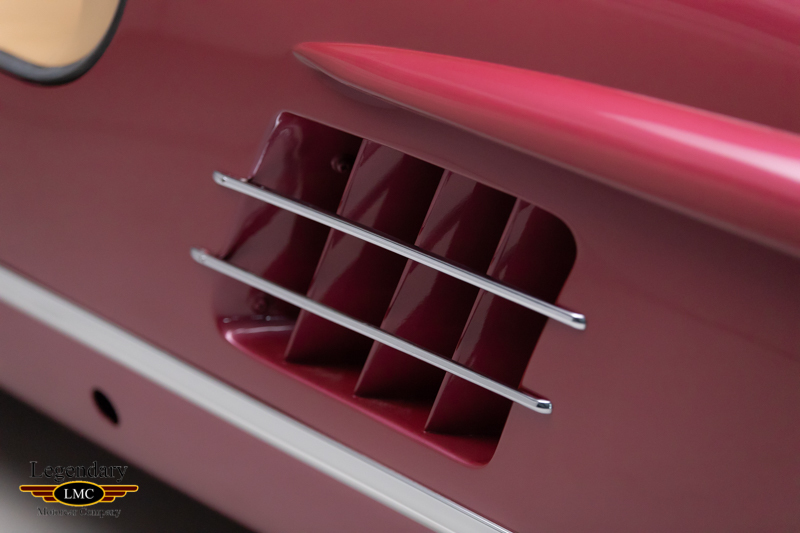 Dr. Luros was an active member in the Gullwing Group, and a copy of his letter submitted with his application to the Gullwing Group dated February 5, 1972 is included. 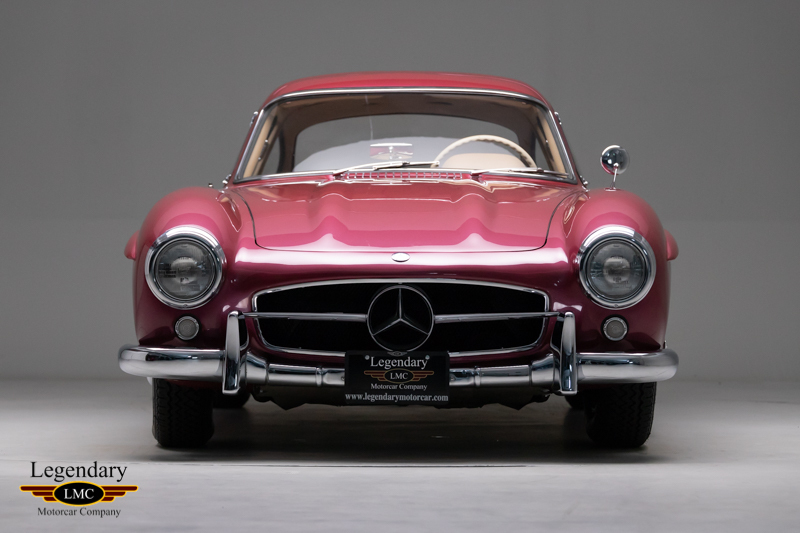 Dr and Mrs. Luros saw a spectacular Gullwing at a concours finished in the optional factory code DB543, which was Strawberry Metallic. 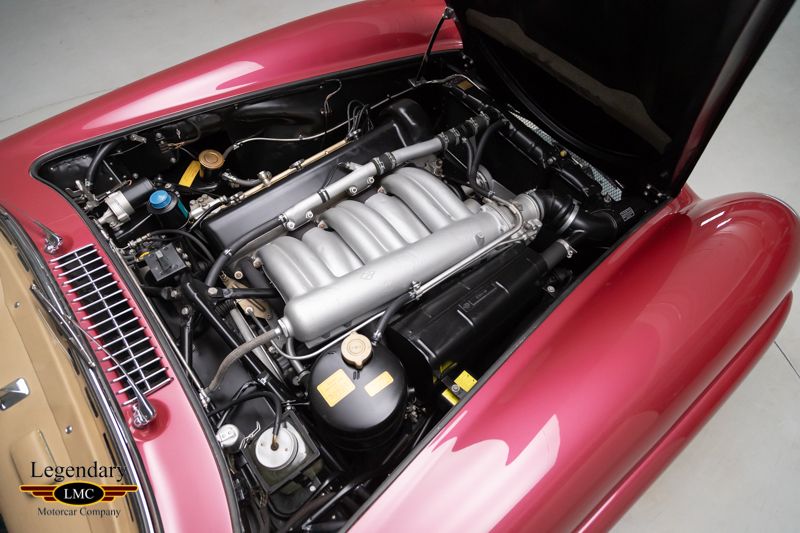 They fell in love and had to have one of their own, so they had their car refinished to match! 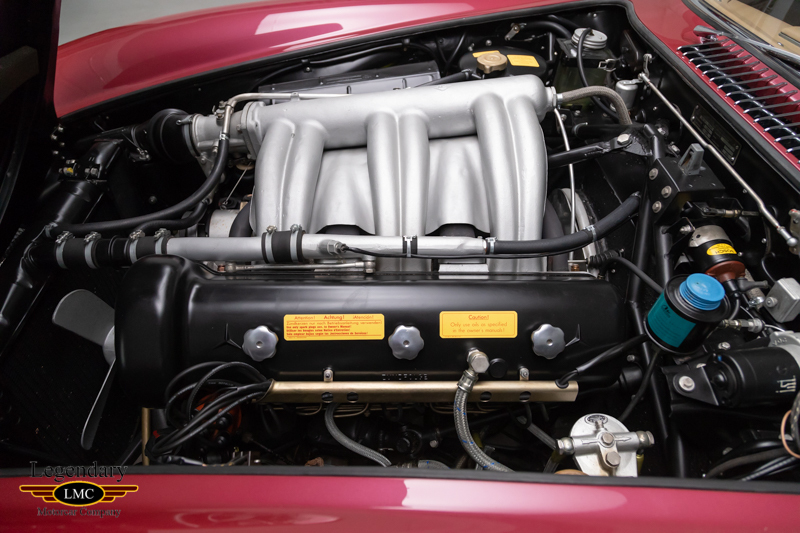 This 300SL comes with Dr. Luro’s original 1961 title together with a batch of his Indiana State registration cards accumulated during his years of ownership. 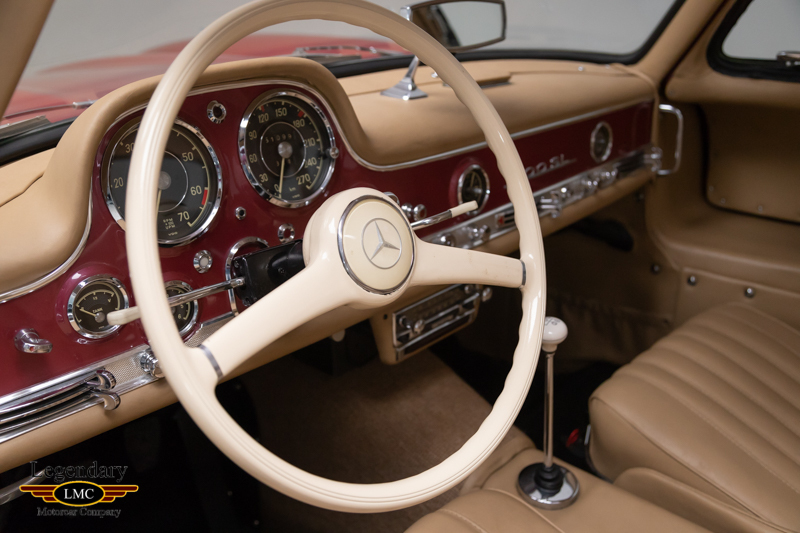 Dr. Luros enjoyed the car until 2005 when it was purchased by the third owner, a longtime Mercedes-Benz collector who had the privilege of owning several 300SL’s over the years through renowned 300SL expert Rudi Koniczek. 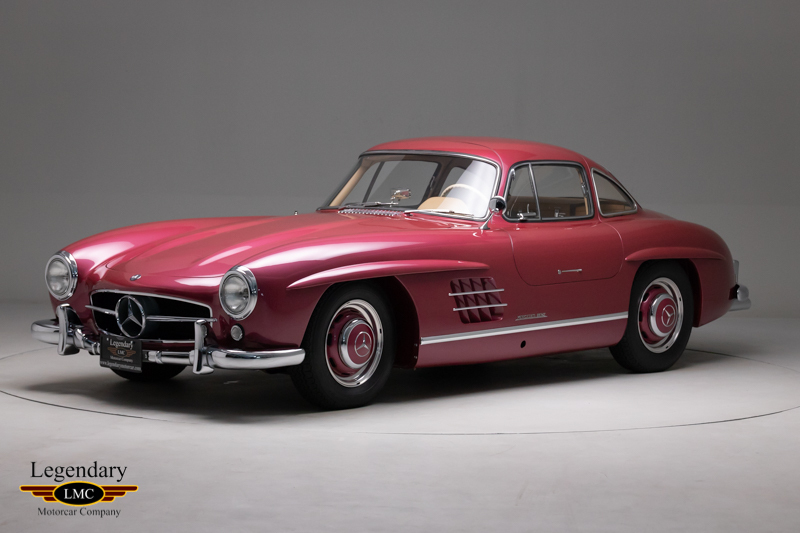 He entrusted Roniczek and his team of skilled craftsmen at Rudi and Company in British Columbia, Canada to perform both a cosmetic and mechanical restoration on this very special 300SL. 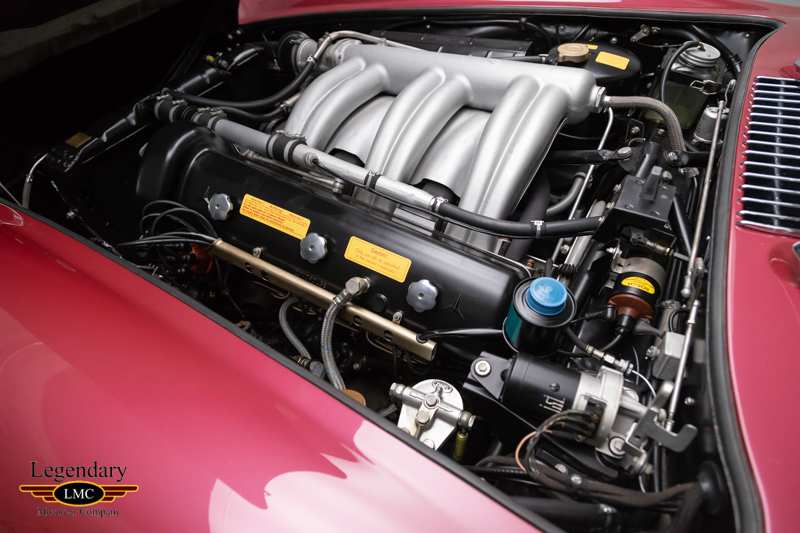 This highly original, matching numbers car is complete with its original belly pans. 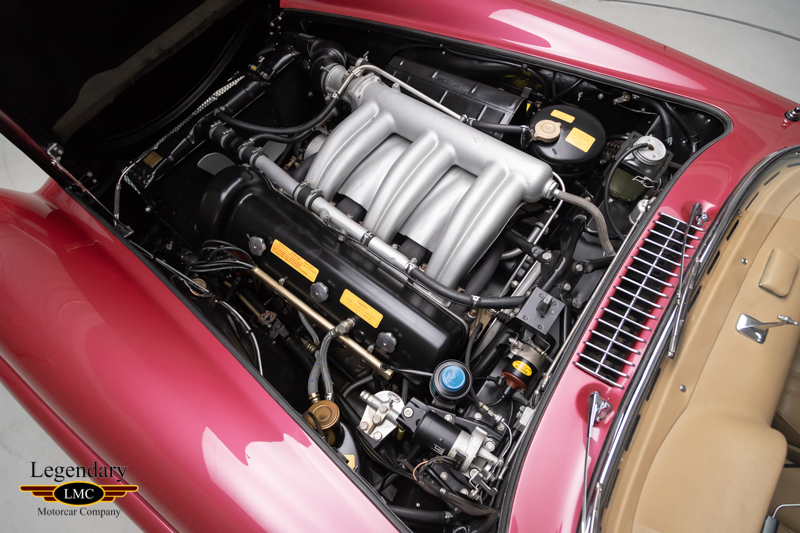 The restoration work performed is documented with receipts by the previous two owners. 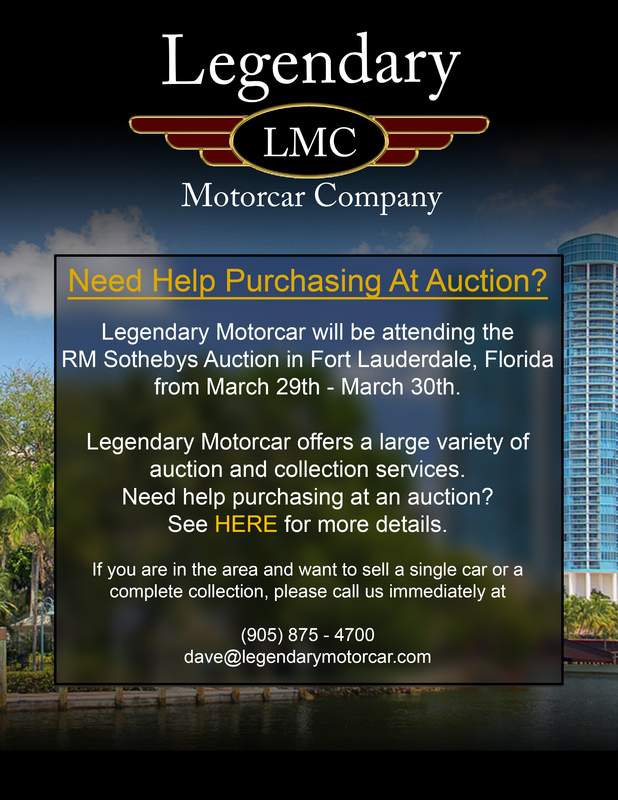 Also included is the owner’s manual as well as the Mercedes-Benz Classic documents. 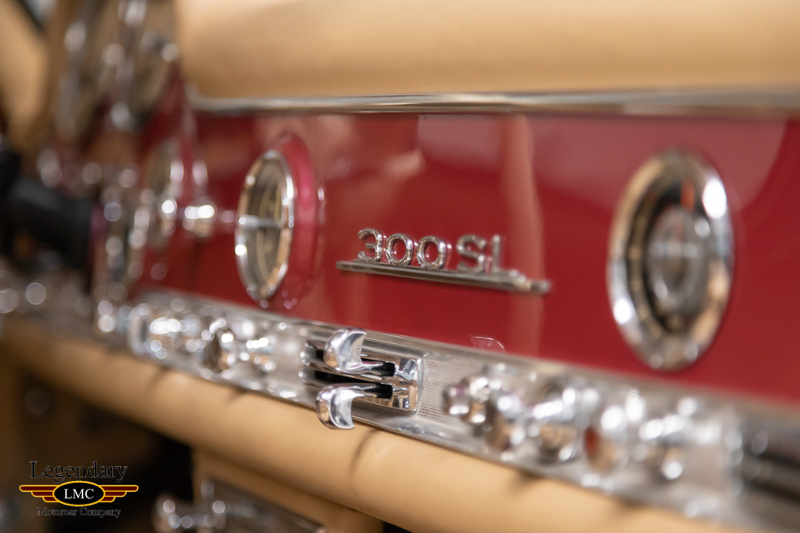 Finished in the striking factory color scheme of Metallic Strawberry with contrasting tan leather interior, this 300SL is simply stunning to behold. 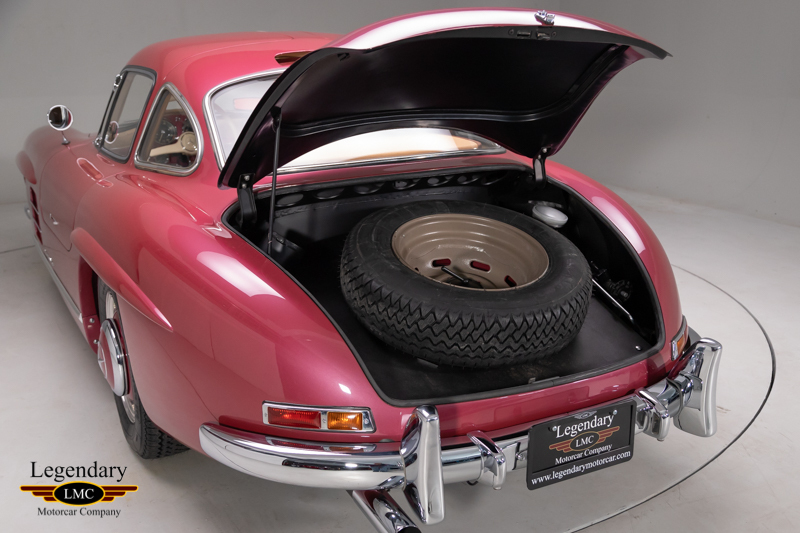 Accessorized with highly desirable, color coordinated, fitted luggage and factory installed Becker Mexico radio, as well as a tool kit. 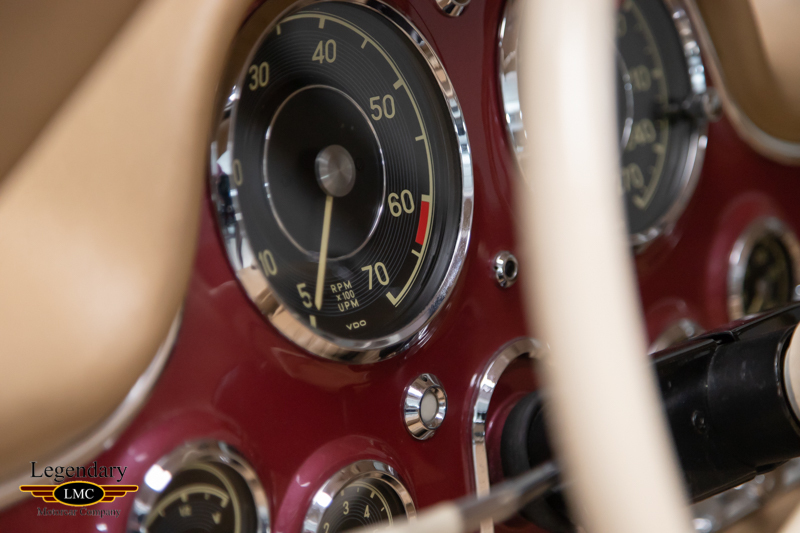 Since restoration was completed, the Gullwing has been driven sparingly and presents splendidly today. 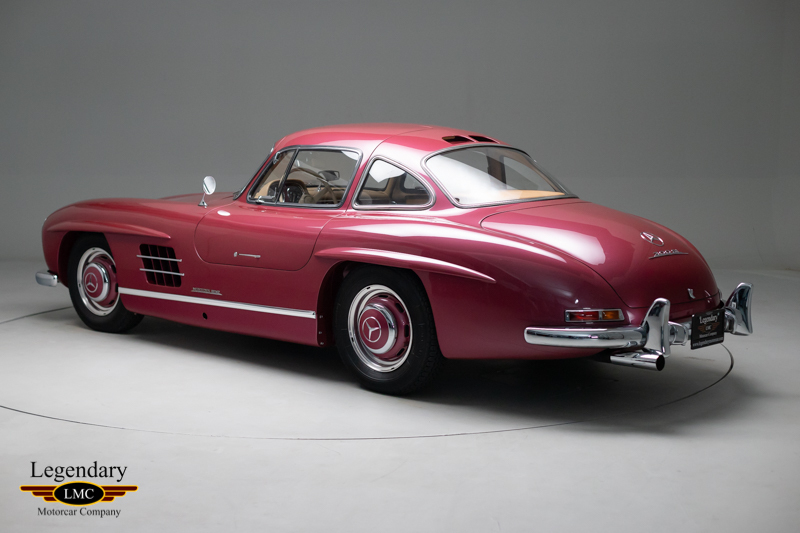 This exceptional 300SL is truly fit for a prince, or any discerning collector wishing to acquire a Gullwing that stands out from the rest. 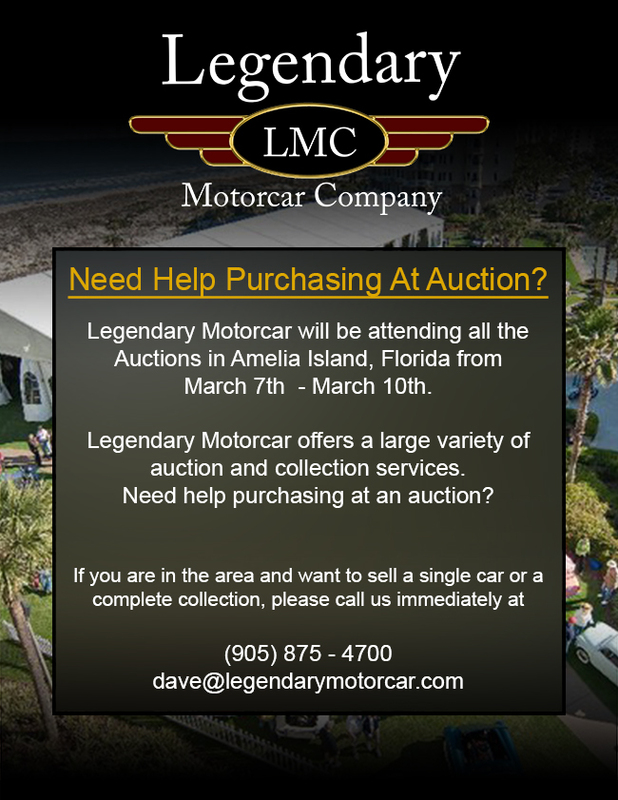 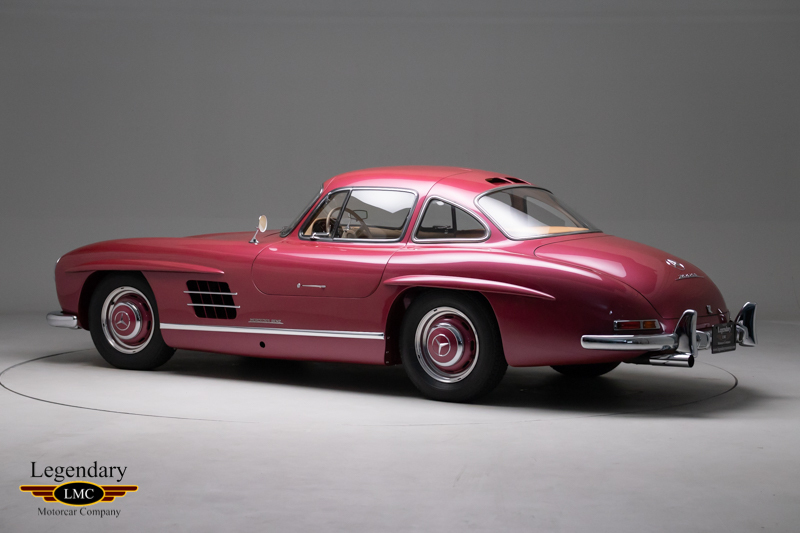 Legendary-Motorcar-Company-Ltd-2019-017 Mercedes-Benz 1956 Mercedes-Benz 300SL Gullwing 2019-017 0 Legendary Motorcar Company Ltd.